Assessing technical feasibility includes evaluating the ability of computer hardware and software to handle workloads adequately. 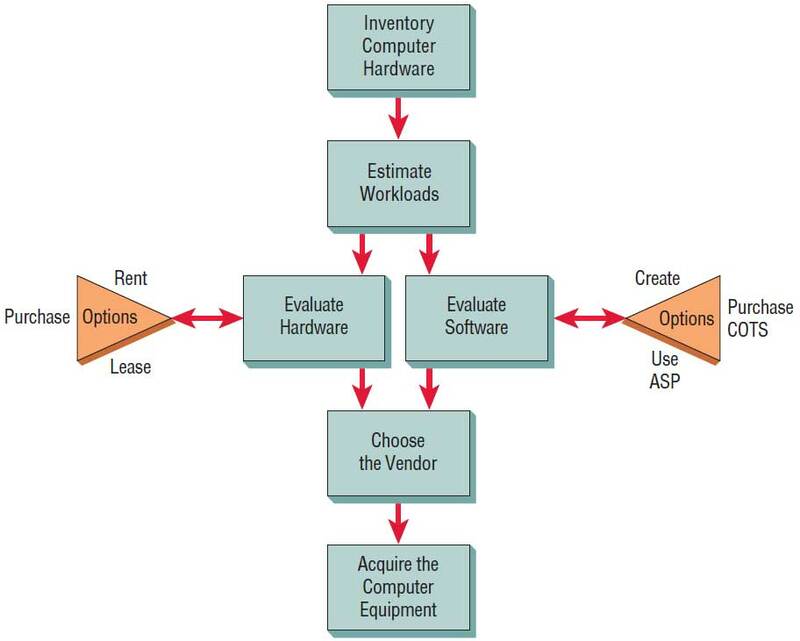 Figure below shows the steps the systems analyst takes in ascertaining hardware and software needs. First, all current computer hardware the organization owns must be inventoried to discover what is on hand and what is usable. The systems analyst needs to work with users to determine what hardware will be needed. Hardware determinations can come only in conjunction with determining human information requirements. Knowledge of the organizational structure (as discussed in Chapter 2) and how users interact with technologies in an organizational setting can also be helpful in hardware decisions. Only when systems analysts, users, and management have a good grasp of what kinds of tasks must be accomplished can hardware options be considered. 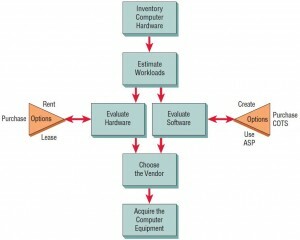 Begin by inventorying what computer hardware is already available in the organization. As will become apparent, some of the hardware options involve expanding or recycling current hardware, so it is important to know what is on hand. The type of equipment: model number, manufacturer. The operation status of the equipment: on order, operating, in storage, in need of repair. The estimated age of the equipment. The projected life of the equipment. The physical location of the equipment. The department or person considered responsible for the equipment. The financial arrangement for the equipment: owned, leased, rented. Ascertaining the current hardware available will result in a sounder decision-making process when hardware decisions are finally made, because much of the guesswork about what exists will be eliminated. Through your earlier interviews with users, questionnaires surveying them, and research of archival data, you will already know the number of people available for data processing as well as their skills and capabilities. Use this information to project how well the staffing needs for new hardware can be met. The next step in ascertaining hardware needs is to estimate workloads. Thus, systems analysts formulate numbers that represent both current and projected workloads for the system so that any hardware obtained will possess the capability to handle current and future workloads. If estimates are accomplished properly, the business should not have to replace hardware solely due to unforeseen growth in system use. (Other events, however, such as superior technological innovations, may dictate hardware replacement if the business wants to maintain its competitive edge.) Out of necessity, workloads are sampled rather than actually put through several computer systems. The guidelines given on sampling in Chapter 5 can be of use here, because in workload sampling, the systems analyst is taking a sample of necessary tasks and the computer resources required to complete them. Table illustration below is a comparison of the times required by an existing and a proposed information system that are supposed to handle a given workload. Notice that the company is currently using a legacy computer system to prepare a summary of shipments to its distribution warehouses, and a Web-based dashboard is being suggested. The workload comparison looks at when and how each process is done, how much human time is required, and how much computer time is needed. Notice that the newly proposed system should cut down the required human and computer time significantly. Task Compare performance of distribution warehouses by running the summary program. Compare performance of distribution warehouses on the Web-based dashboard. Method Computer programs are run when needed; processing is done from the workstation. Updates occur immediately; processing is done online. Run program that summarizes daily records and prints report; get report and make evaluations. Enter shipments on the Web-based system using automatically backed up drop-down boxes. Data are to remote location. Compare warehouses online using the performance dashboard; print only if needed. Evaluating computer hardware is the shared responsibility of management, users, and systems analysts. Although vendors will be supplying details about their particular offerings, analysts need to oversee the evaluation process personally because they will have the best interests of the business at heart. In addition, systems analysts may have to educate users and management about the general advantages and disadvantages of hardware before they can capably evaluate it. Based on the current inventory of computer equipment and adequate estimates of current and forecasted workloads, the next step in the process is to consider the kinds of equipment available that appear to meet projected needs. Information from vendors on possible systems and system configurations becomes more pertinent at this stage and should be reviewed with management and users. In addition, workloads can be simulated and run on different systems, including those already used in the organization. This process is referred to as benchmarking. The time required for average transactions (including how long it takes to input data and how long it takes to receive output). The total volume capacity of the system (how much can be processed at the same time before a problem arises). The idle time of the CPU or network. The size of the memory provided. Some criteria will be shown in formal demonstrations; some cannot be simulated and must be gleaned from manufacturers’ specifications. It is important to be clear about the required and desired functions before getting too wrapped up in vendors’ claims during demonstrations. Once functional requirements are known and the current products available are comprehended and compared with what already exists in the organization, decisions are made by the systems analysts in conjunction with users and management about whether obtaining new hardware is necessary. Options can be thought of as existing on a continuum from using only equipment already available in the business all the way to obtaining entirely new equipment. In between are options to make minor or major modifications to the existing computer system. The rapid advance of technology dictates that the systems analyst research types of computers available at the particular time that the systems proposal is being written. Computer sizes range all the way from miniature mobile phones to room-sized supercomputers. Each has different attributes that should be considered when deciding how to implement a computer system.